Sugar Maple Interactive, a Raleigh-based software solutions and services provider, was recognized as the developer of a Top 100 College website by My College Options® 14th Annual Enrollment Power Index® Program. 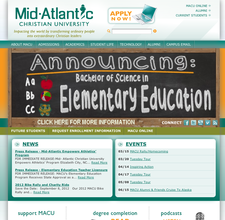 Mid-Atlantic Christian University (MACU), a Sugar Maple Interactive client, earned an A rating for their website putting them in the top 5% of all college websites. High School students rated every college website in the country on many key features such as: the ability for students to apply online, find information on the community or city in which the college is located and the ability to contact the admissions office to set-up a campus visit. They also graded the website on the ease of navigation and its design. For more information about Sugar Maple Interactive, please contact Sales and Marketing at 919.622.2594, or visit us online at www.sugarmapleinteractive.com.